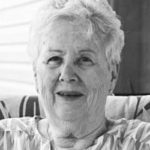 CULLOM – Patricia Ann “Pat” Johnson, 82, of Cullom passed away at 1:24 p.m., Saturday, December 15, 2018 at Luther Oaks in Bloomington. Pat was born in Onarga September 16,1936, daughter of Lowell “Wayne” and Ruth Vandaline Austin Skates. She married Donald Lee Johnson August 1, 1959. He preceded her in death on April 23, 2012. Surviving are two sons: Karl Leon (Gina Ehler) Johnson of Columbus, Ohio; and Michael Leon (Cindi) Johnson of Normal; two granddaughters: Emily Johnson and Kayla Johnson; a grandson, Patrick Alexander Ehler; two brothers: Dennis (Kay) Skates of Watseka and Richard (Judy) Skates of Rock Falls. Pat graduated from Onarga High School and Illinois State University. She taught school in various country schools and many years at Tri-Point Schools, many of those years as a librarian. Pat was a proud mother and grandmother, and she was a treasured friend to many. She enjoyed quilting for church and family, loved to read, do crossword puzzles and enjoyed traveling with family and friends. The world was a better place for her being in it. She will be dearly missed by many. Her funeral was held at 10 a.m., Tuesday, December 18, at St. John’s Lutheran Church in Cullom with Pastor Mauricio Vieira officiating. Burial followed in Mona Township Cemetery, rural Kempton. Visitation was from 4 until 7 p.m., Monday, at the church. Memorial contributions in her name may be made to Cullom Beckman Memorial Library. Calvert & Martin Funeral Home in Cullom was in charge of arrangements.